A Harvest festival has been a part of every culture since the time man has started planting crops and gathering food. “Pongal” is also one such harvest festival celebrated widely in states like Tamil Nadu, Andhra Pradesh, Karnataka and Pondicherry in India. “Pongal” is celebrated for four days as a thanksgiving to the Nature God for helping them all through out the year with rain and sunlight. 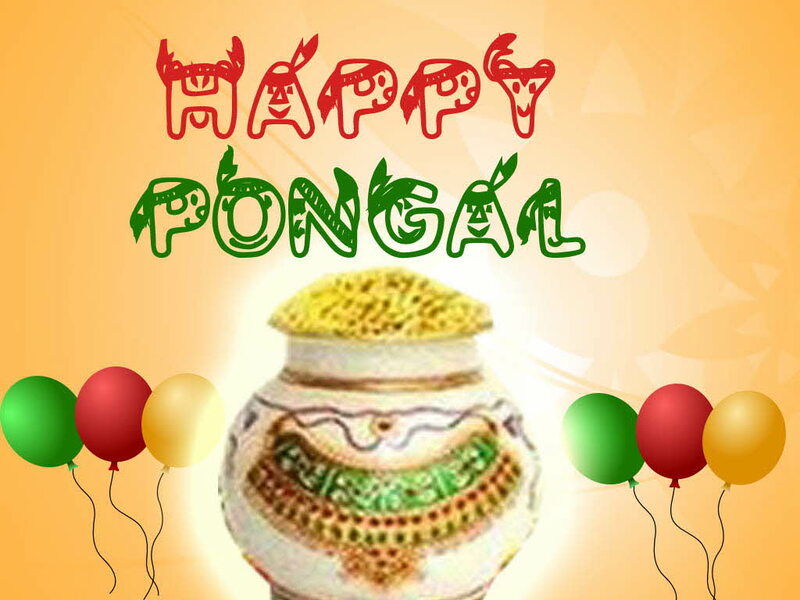 The word “Pongal” is a Tamil word where “ponga” means boil and “Pongal” means the spill over. On this occasion, people gather together and cook rice and milk together in an earthen pot and say “Pongolo Pongal” when the rice spillover. This sweet dish called “Pongal” is later offered to the Sun God. This harvest festival also marks the beginning of Uttarayana which is the most auspicious time in the Hindu calendar, because this is the time when the sun moves towards the North for the next six months. On the first of the four day festival, the farmers arrange special pooja before cutting the paddy and worship the sun, the earth and the ploughs and the sickles are used for farming. Later these tools are used to cut the newly harvested crops and this day is also celebrated as “Bhogi Pongal” in the honor of Lord Indra the Lord of rains. Also, people throw the useless household wooden articles into a fire. Women dance around this fire singing songs and dancing in the praise of god. On the second day, people put a colorful ‘rangoli’ in front of their house and are seen making “Pongal” and offer it to the Sun God along with two sticks of sugarcane, coconut, turmeric plant. On the third day, i.e. on “Mattu Pongal” the farmers dress up their cows with multi colored beads, paint their horns and tie a garland round their neck and worship them. Later young men conduct a race between the cows which is an event in every village. The fourth day is celebrated as “Kannum Pongal” where women place the leftovers of the sweet pongal and other forms of rice on a turmeric leaf and pray for the prosperity of their brothers and the brothers gift their sisters on this occasion. It is believed that “Pongal” is dated back to the Sangam Age as a festival for the farming community. It was believed that by offering sweet pongal to the Sun God on this auspicious day one will clear their past sins. The festival of “Pongal” is normally celebrated from the 14th of January to the 17th of January. This festival is marked when the sun moves from the Tropic of Cancer to the Tropic of Capricorn i.e. from Dakshinayana to Uttarayana and it is hence observed that from this day the days are longer and the nights are shorter. This festival completely depends on the position of the sun unlike the other festivals in the hindu calendar which depend on the position of the moon. Hence by default “Pongal” falls around the same time of the year i.e. Mid January. The next six months are considered to be the best time for marriages, and new ventures.